Almonds are within a hard shell. These nuts after being shelled can be eaten roasted and have a mild flavor. Common names are Mandeln, Amendes, Badam. 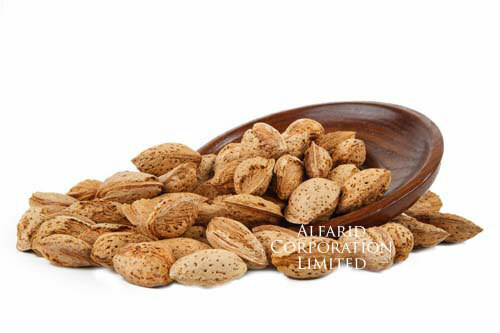 The shelled almonds are used in making savory dishes as well as desserts. These are high in vitamin E and are also believed to reduce risk of heart disease. Almonds are within a soft shell. These nuts after being shelled and can be eaten roasted and have a mild flavor. Common names are Mandeln, Amendes, Badam. It is used in culinary purpose, almond milk, gifts and celebrations. It has vitamin E and helps in reducing heart disease. 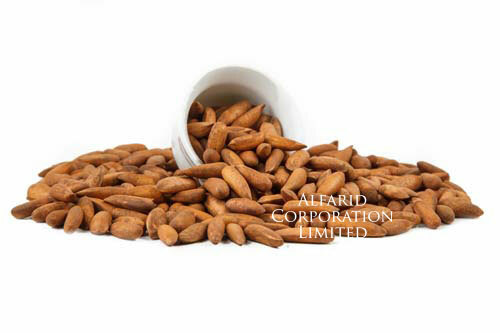 Almond Kernels are popular nuts. These are shelled, having a brown skin, while the inside of the nut is white. These nuts are eaten roasted and have a mild flavor. Common names are Mandeln, Amendes, Badam. 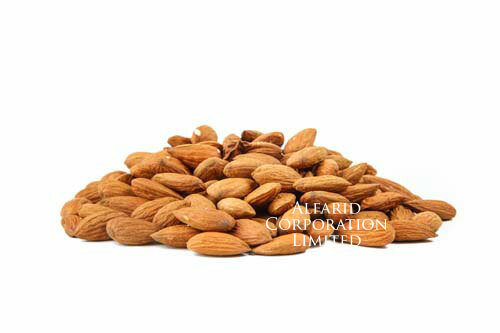 Almonds are used in baking, desserts and savory dishes. It is also used in making almond milk. It is a rich source of vitamin E and is believed to improve memory retention. 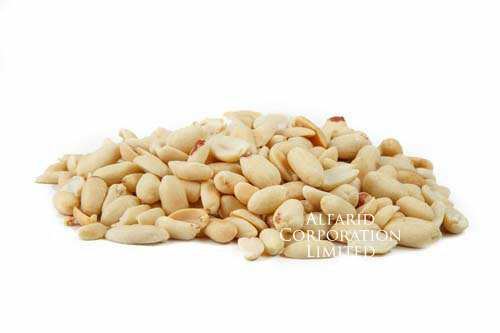 Pine nuts in shell are one of the most demanded dried nut that belong to genus Pinus Pinea. It is sweet and crisp in taste. It is shelled and can be eaten raw or roasted. Common name is Chilgoza. It is rich in carbohydrates. It is used in making pine nut oil, pesto sauce and other savory dishes and desserts. 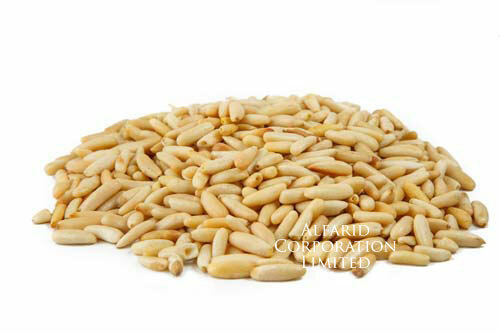 Pine nuts without shell are one of the most liked dried fruit that belong to genus Pinus Pinea. These are sweet and crisp in taste. It is shelled and can be eaten raw or roasted. Common name is Pine nut and Chilgoza. It is used in gift and celebrations, baking and savory dishes. Walnut is a brain shaped nut within a hard shell. Once shelled, can be eaten raw. Walnuts have a mild flavor. Scientific name is Juglans regia. Common names are Walnut, Akhrot, English or Caucasian Walnut. These are used in savory dishes and baking. These are naturally rich in oil content. Walnut is a brain shaped nut. It has a mild flavor and can be eaten raw. 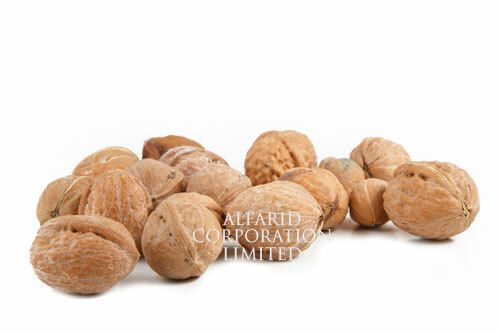 Common names are Walnut, Akhrot, English or Caucasian Walnut. It has good fats and helps in reducing inflammation in arteries. 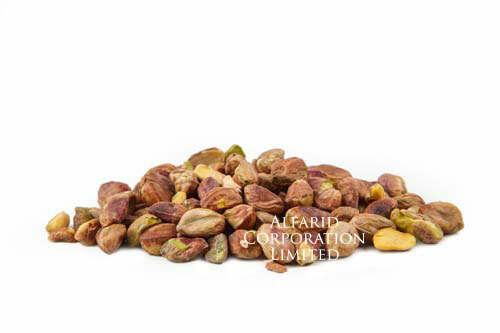 Pistachios are sweet and crisp nuts within a shell. Once shelled, these can be eaten raw. 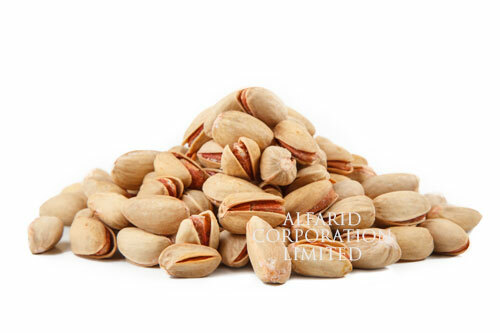 Common names are Pistachios, Pista, Colossal Pistachios. It is used in ice creams, garnishing, gifts and celebration. It is high in vitamin A & E and beneficial to nervous system. Pistachio Kernels are sweet and crisp nuts. These can be eaten raw and roasted. Common names are Pistachios, Pista, Colossal Pistachios. It is used in puddings, cakes and desserts. These are rich in Vitamin A & E and are believed to improve memory retention. 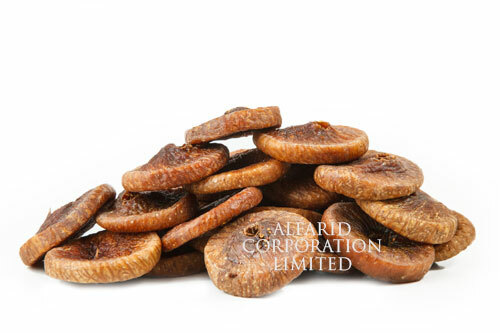 A very popular dry fruit of winter season. The peanuts are shelled and can be eaten raw. Its color ranges from light brown to beige. 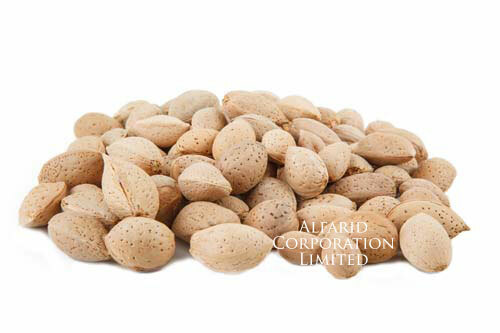 Common names are Peanuts, Moong Phali, Ground Nut. These are rich in fibre, protein, minerals, Vitamin E and antioxidants. These are used in making peanut butter and in savory dishes. A very popular dry fruit of winter season. The peanuts can be eaten raw. Its color ranges from light brown to beige. Common names are Peanuts, Moong Phali, Ground Nut. These are used as ingredient in savory dishes, seasoning and gifts. 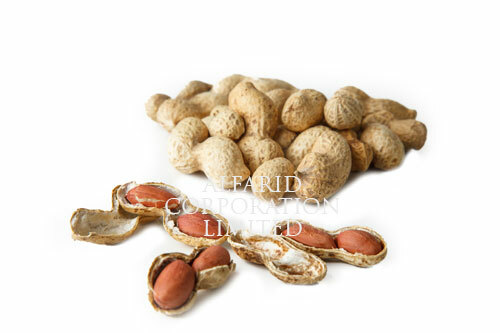 It is rich in vitamin E that helps in skin protection and reduces heart disease. Figs are naturally sweet fruits. Its color ranges from light to dark brown. Common names are Fig, Anjeer, Higo, Figue, Fico, Dumur. Common uses are baking and desserts, jam and syrups, gifts and celebrations. It is rich in fiber, iron and calcium. It improves digestion, prevents hypertension and helps in weight loss. 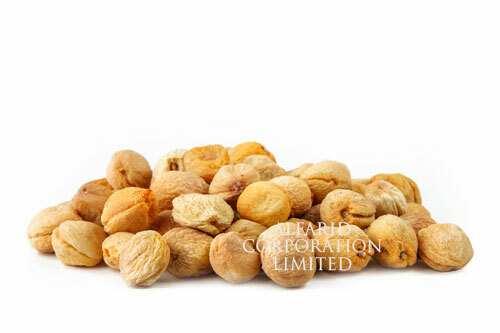 Dry Apricot Fruit is sweet in taste. The seed within the Apricot is hard like stone. Its scientific name is Prunus Armenaica. Common names are Prunes, Khubani, Apricot. It is used in baking, snacks, jams, savory dishes and ayurveda. It is rich source of vitamin A and helps in solving heart and eye problems. 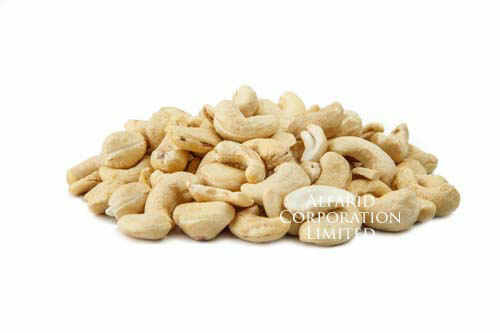 Cashew nuts are the edible kidney shaped nuts that have a naturally delicate flavor, ready to roast. Common names are Cashews, Kajoo, Maranon, Merey, Cajueiro. It is used as an ingredient in savory dishes, seasoning, baking, jams, chutneys, beverages. It helps to boost energy level. Cashews are rich in essential minerals, antioxidants and magnesium. Dry dates color ranges from dark red to deep brown. The flesh is semi soft and cores are inedible. Common names are Dates, Dattes sechees, Chuara, Khajoor. These are used in baking and desserts, pickles, ice cream, date oil, gifts. Dates are cholesterol and fat free and provide energy and sustenance. Black Currants are tiny berry like fruit. It is very sweet in taste and are black in color. It is used in baking, desserts, snacks, seasoning, jams and juice. 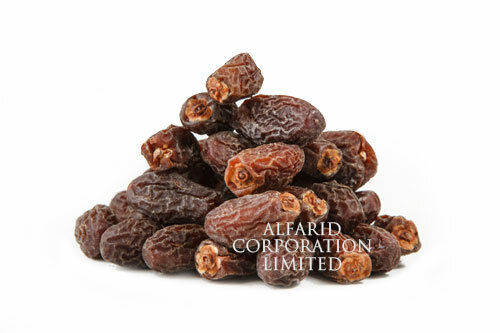 It treats skin disorders and arthritis and is a rich source of vitamin C.
The most popular of raisins is the Golden Sultana raisins. It is the dried form of white seedless grapes, and are very sweet in taste. Sultanas are bigger in size as compared to the other raisins. 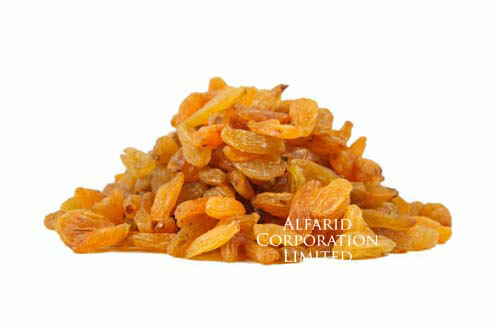 Common names are Sultana, Kishmish, Golden Raisins. 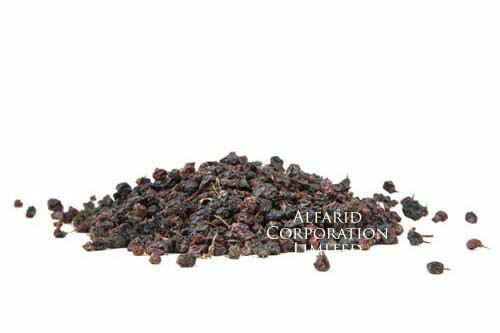 It is used in baking, snacks, seasoning, wine and extract. It is cholesterol and fat free and is rich source of vitamins, iron and minerals. 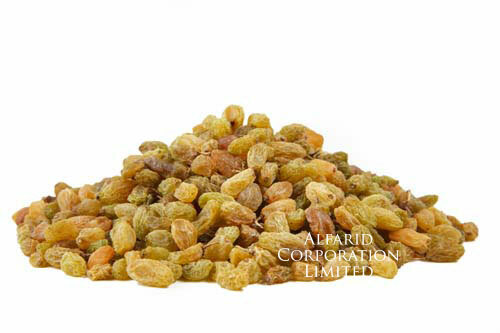 Green raisins are very sweet in taste and are mostly eaten raw. Its common names are Kishmish, Raisins. It is cholesterol and fat free, rich source of vitamins, iron and minerals. These are used in desserts, snacks, wine, extract, gifts and celebrations. These are dark black in color and some are over ripe. The taste is sweet and savory. 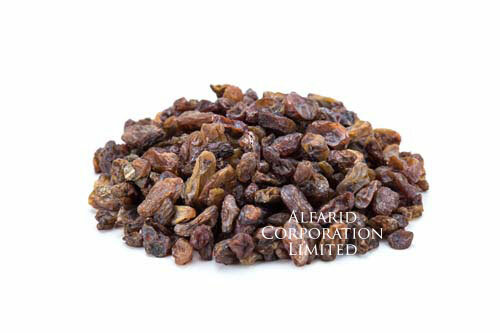 Common names are Industrial Raisin, Kishmish. It has industrial use and is also used in producing oil and extract.